Ten years ago today I was turning 18. It was September 10, 2001, and my friend had gotten me a mint chocolate chip ice cream cake to celebrate. Covered in balloons made of icing, it was a delicious throwback to childhood; perhaps an ironic way to honor its passing. We ate most of it in our dorm room and smushed what was left between our fingers and into each other’s faces. I went to sleep that night in the first home away from home I had ever had: a dorm room on Washington Square Park. It was my first month of college at NYU. At 3 o’clock in the morning my brother called from Los Angeles to wish me a happy birthday (technically it still was over there). I answered sleepily, thanked him, and told him not to worry for calling me so late. I woke up again that morning to a call from my roommate’s boyfriend, informing us that a plane had just crashed into the World Trade Center. Before all this, I was discovering a city. I was enticed by its adventures, intrigued by its characters, and puzzled by its inhuman rhythms I must soon adopt. Stepping outside of one’s building was like merging onto a freeway. There seemed to barely be time to smile at a stranger, let alone strike up a conversation. You might be late. I was baffled by the culture of buying that never seemed to let up: not at night, not on holidays, not even on a Sunday. People shopped on their lunch breaks, while the homeless crowded around heating vents. While some strutted along the sidewalks, most hustled in that intimate daily dance between abundance and need. Though they were full of life, the streets were decidedly male. For the first time I felt sized up, picked apart, preyed upon, and violated just walking down the street. And then there was the loneliness. I remember wondering how one could feel so alone in a city with so many people. Bob Marley’s “Concrete Jungle” would grow to be my anthem that semester. My new experiences with this urban landscape full of injustice and exorbitance were out of sync with what my naïve liberal Californian mind was convinced of. Principally, the idea that the world was “getting better.” Equality, Justice, Human Rights; these were now just buzzwords in the wake of successful social struggles and movements; good things to keep in mind, but not actually fight for. Sure bad things happened all the time. Not everyone could go to college, and that was unfortunate. But they were just that, misfortunes that happened by chance and not, as I came to learn, by design. I was not totally ignorant. George W. Bush claimed the presidency in 2001 when I was still 17. Voting wouldn’t have matter anyway given that I lived in California and the elections were ultimately stolen, but I remember my outrage at the result, and my little act of resistance: a pin that said AMBUSHED. I thought it was clever. In New York I wanted to find sophisticated people and minds in New York. Instead I found sophisticated clothing, sophisticated egos, and sophisticated ad campaigns. School, I thought, was surely where I would find those forward-thinking, inquisitive minds I was looking for. But instead of being ready to learn, many of my fellow students seemed to already know everything. Class appeared to be merely a way to affirm beliefs they had gleaned long ago from their parents, television, or mediocre high school curricula. Except for some important exceptions, I found most professors unwilling or uninterested in upsetting the popular paradigm of their 18-year-old students. I was studying Communications, which meant marketing, advertising, public relations, some vague notion of creativity, and money. I was studying it not because it would fulfill any desire for knowledge nor expand my understanding of the world, nor actually help anyone in it, but because it would fulfill a lesson my mother had taught me was of great importance: being economically stable enough to raise children, live one rung above comfortable, and be able to send my kids to “good universities.” That is in fact what she had worked 30 years of her life to do, and did well. Before the second tower fell, I called my mother from a payphone to let her know I was all right. She was surprisingly calm, and in turn, so was I. By the time I hung up, the World Trade Center and thousands of lives were gone. The streets were a circus of fearful confusion and sorrow. Clusters of people would take off running, not knowing where danger could be coming from. Looking back, it was indeed a window into what so many Afghans, Iraqis, Pakistanis, and others in the crosshairs of the US-led “War on Terror” have lived every day of the last decade. The anxiety and timelessness of violence. The choking sensation of loss and helplessness. The biggest surprise was that revenge –never mind that it was blind, sloppy, and costly—was the only thing on the table. There was no time to think, no time to heal, no time to understand. And that was part of the plan. I changed majors, went to the office hours of certain beloved professors, attended lectures, wrote angry emails to the NY Times, and perhaps most importantly, became active in groups working for peace both on my campus and in the city. I became part of a movement, made up of so many movements throughout history, full of folks committed to working for justice whether in their neighborhood or on an international scale. I found the challenge and community that I had been looking for; something neither the city lights nor university could offer me. It felt like the last 18 years of my life I had spent knitting a sweater, perplexed at how it would keep unraveling, and then in a year I was finally able to pull all the threads together and make sense of things. As the drums of war began to beat for an invasion of Iraq, and the media marched in step with government’s orders, we organized teach-ins, sit-ins, die-ins, boycotts, and busses to D.C. for numerous mobilizations. 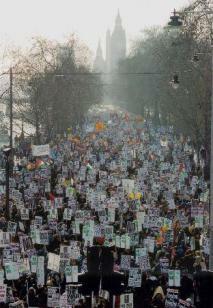 I can only describe 2003 as magic—a marching down Broadway, sun in your face, voices echoing off the buildings magic. A feeling that I had never had before: solidarity, collectivity, strength and power directly from the people. Imagine that. And on February 15, I participated along with 11 million (or more) people around the world in the largest international demonstration in history. The NY Times called us “a second superpower.” Manhattan was transformed into a playground for the peacemakers. We owned that town that day. When I got home I looked online for photos from demos in other cities. Rome, 3 million. Madrid, 1.5 million. London, Cairo, Lima, Manila, Cape Town, Istanbul, Berlin, Santiago, Dublin, Damascus, Buenos Aires (woot! ), the list went on and on. I kept scrolling as the tears streamed down my face. But of course, then came the biggest magic trick of all: the war on Iraq. In those years I came face to face with a reality Martin Luther King Jr. so boldly stated a year before he was assassinated: The greatest purveyor of violence on the planet was my own country. From Vietnam to Central America, from Iran and Iraq all the way down to Chile where on another 9/11 we helped overthrow democratically-elected president Allende, we were the ones who were aiding and abetting terrorism. We were the ones working against democracy. Economically, we were responsible along with other nations, for making sure that countries never fully developed and never became self-sufficient. We slap them with free trade agreements, structural adjustment programs, cheap imports, and taxed exports, and debt. Then we shake our heads at their attempts to feed and educate their own populations, and if they get out of hand, we take the money and run or fund a military coup. It’s a hard pill to swallow, but the rest of the world already has. Today I am 28, and the world is a different place. The American empire, like it or not, is in decline, thanks in part to the plans to exert its perpetuity. We have seen a promising unique presidential candidate transform into a predicable run-of-the-mill politician, backtracking on promises and digging our nations’ heels further into war and economic and environmental crisis. And as we move into an election year and our votes are once again solicited with well-crafted speeches, we would be wise to remember that it’s we the people who made Obama, and it’s only we who can pressure. Let’s remember what abolitionist Frederick Douglass put so clearly: power concedes nothing without a demand. Today I also have the privilege to call so many peacemakers and poets, thinkers, writers, and community organizers—so many of you—my friends. I have had fits and starts of a career, and hopefully this year there will be more starts than fits. Sure everyone wants to live comfortably, to provide for a family and take vacations. But at what cost does this comfort come? I was born on September 10, 1983 in Palo Alto, California. If I had been born on September 10, 1983 in Kabul, Afghanistan, there is good chance I wouldn’t be alive. Maybe life is enough. Or maybe I’m just stubborn. I want to have my cake, eat it, and share it with others. I’m not convinced it can’t be done. Here in Argentina, I have found new adventures, a great love, and most importantly, myself. I have learned so much from the people here, who have suffered and struggled through their own political and economic crises. When I see Bush and Cheney parading around the country on book tours, I think of the saying the Argentines who fight against the impunity of the Dirty War and the military dictatorship have: Ni olvido, ni perdón. Neither forget, nor forgive. On this 10-year anniversary of 9/11 we need truth and we need justice so that we can heal. We need the time to be able to breathe deep, the peace to be able to love, and the joy of childhood so we can smush ice cream cake through our fingers and laugh, because we know this world and all of its creatures are good. IVAW is working with a coalition of anti-war and social justice organizations to launch a Decade of War Awareness Monthfrom September 7 to October 7. Throughout the month, we will be working with our partner organizations (including Military Families Speak Out, War Resisters League, Veterans for Peace, and Afghans for Peace) to promote relationship-building among people and communities affected by U.S. militarism and the war economy in both the U.S. and Afghanistan. War Resisters League, begun in 1923, is a secular pacifist organization that works around issues ranging from military spending, army recruitment, and anti-Arab racism. Known for its nonviolence trainings for activists, the WRL continues its educational role and has developed a popular curriculum called “Bombs and Budgets” in partnership with the South Asia Solidarity Network. War Times is a bi-lingual online publication dedicated to bringing sharp left analysis of U.S. foreign and domestic policy from Afghanistan to Wisconsin. With a dozen writers hailing from different areas of social justice work, War Times is your personal guide to understanding the latest wheelings and dealings in Washington and the movements for change in the U.S. and around the world. I write for them!